This is a funny, funny book and a quick read. I frequently laughed out loud as did my husband when I read portions of it to him. The editors have “managed to convince eleven dogs from all walkies of life to come forward” and tell all! It describes “the other side of the story” in the amazing relationship(s) between dogs and their humans. You will meet and hear the stories of 11 different dogs. 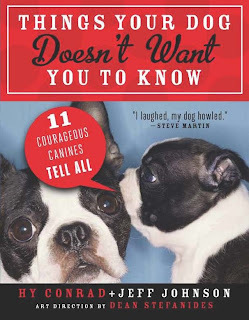 Readers will finally get the answers to questions they’ve always wondered about, like why do dogs stick their heads out of car windows, why do dogs circle before going to sleep, why do dogs wag their tales and most important, what is the biggest dog secret of all? On the subject of why dogs wag their tales, here is a tidbit from the authors, “unless you’re very dim – I mean golden retriever dim – your real question isn’t why do we wag, but why do we wag to show happiness. I mean, monkeys don’t wag their tales when they are happy. Birds don’t. And cats – well, they’re never happy, not in any meaningful way.” As a cat owner I’m not sure I agree with that! Read about Tinkerbell and her pack (of 4 dogs) – what a prima donna! Meet good-natured Axelrod and Dimples, the new mom with her advice on dog and child rearing, slightly ditsy Moonbeam whose owner practices holistic dog care and sweet, aging, Sophie. Here are some chapter titles to whet your appetite – “Your Psychic is a Fake”, “My Opinion of Boys”, The Reason I Ate the Sofa”, “I’m Not a Strict Vegan” ”Why I Hate Dogs” (Moonbeam’s viewpoint). There is even a “Frequently Asked Questions” chapter by Moonbeam – too hilarious! This is a perfect gift for dog owners or those who are contemplating getting a dog for the authors have managed to capture the “essence” of what it means to be a dog and why we are better humans for having them around. Disclosure: Thanks to the authors Hy Conrad and Jeff Johnson for sending me this book for review. I was not compensated in any other way, nor told how to rate or review this product.